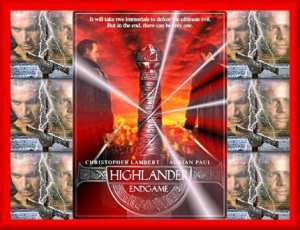 20 images (some from other highlander movie and tv) from the latest Highlander by Dimension Films(images copyright). Read a review of this movie at JoBlo's Movie Emporium. Music- starting with dialog "..in the end, there can be only one." Then "Theme from Higlander" by Queen, and ending with "Who Wants to live forever", by Queen. This is a zip file; you will need an unzip program, such as Winzip to open. Screensaver copyright, ART-TLC ©.